This finding has some practical implications for vaccination and could point the way to additives that could boost vaccine effectiveness in elderly humans. Researchers at Oxford have demonstrated that autophagy is diminished in T cells from aged mice, and T cell responses could be boosted in older mice using the autophagy-inducing compound spermidine. 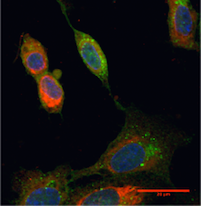 Autophagy here is indicated by green speckles, while red indicates vaccine antigens. Thanks to Pulendran lab for image. In the Nature Immunology paper, Ahmedâ€™s team showed (using its workhorse LCMV infection model) that autophagy is activated as T cells make the transition to memory and if genes needed for autophagy are disrupted in mice, so is memory T cell formation. The first author is The researchers hypothesize that autophagy isÂ helping to preserveÂ T cells that have recently undergone a burst of proliferation, by performing functions such as removal of misfolded proteins or damaged mitochondria that generate reactive oxygen species. Some previous evidence for the autophagy-immunity connection has come with Bali Pulendranâ€™s labâ€™s study of the yellow fever vaccine and the autophagy-regulating gene GCN2. It also weaves together with the Ahmedâ€™s lab previous discovery that the drug rapamycin, usually thought of as an immunosuppressant, can promote memory cell formation. The Ahmed labâ€™s results contradicted some previous reports on autophagy in T cells, which had found that autophagy was important for the initial burst of T cell expansion. Ahmedâ€™s team used a strain of mice engineered to delete autophagy-related genes only after T cell activation, so that the T cells would be normal at the time of viral infection. Previous studies used mice that deleted autophagy-related genes during T cell development, which means that the T cells were abnormal for a long time before being called upon to proliferate.